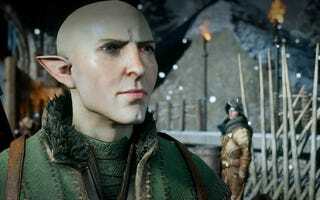 The first single-player downloadable content for Dragon Age: Inquisition will be out tomorrow, Kotaku has confirmed. Well, unless you're on PlayStation. Then you'll have to wait a while. DLC pack #1 for Inquisition is called "Jaws of Hakkon," which is likely named after a Dragon Age god named Hakkon Wintersbreath. It's coming out tomorrow for Xbox One and PC. PlayStation 4, PS3 and 360 players will have to be patient (assuming it also comes to PS3 and 360), because EA and Microsoft have made some sort of deal and isn't console exclusivity just great? Though the above image is (intentionally?) vague, it's our understanding that the DLC itself will indeed be out tomorrow for Xbox One and PC, not just a trailer. UPDATE (4:13pm): Just to be totally clear, I talked to BioWare boss Aaryn Flynn: "The DLC is coming out tomorrow on Xbox One and PC," he told me.